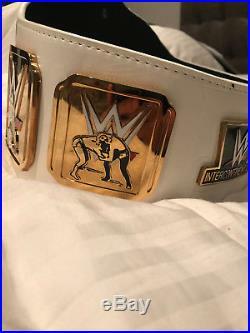 You can see the original belt listing here: WWE Web Site. The belt is in excellent condition with no marks. Featuring the NEW WWE Logo unveiled in 2014, this WWE Intercontinental Championship Replica Title Belt is an exact-scale replica of the one seen on Monday Night RAW & Smackdown. Strap Dimensions: 49.61" x 9.45" x 0.2. 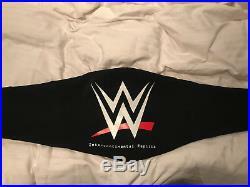 Includes Cloth Carrying Bag with WWE Logo. Main Plate: 11.02" x 8.54". 1st Side Plate: 3.5" x 3.54". 2nd Side Plate: 3.11" x 3". 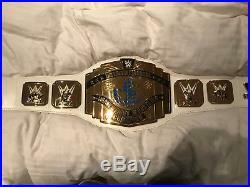 The item "WWE Intercontinental Championship Replica Title (2014) Belt" is in sale since Friday, August 10, 2018. 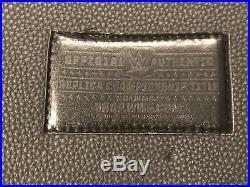 This item is in the category "Sports Memorabilia\Wrestling Memorabilia\Other Wrestling Memorabilia". The seller is "stevel123" and is located in Wolverhampton. This item can be shipped to United Kingdom, Antigua and barbuda, Austria, Belgium, Bulgaria, Croatia, Cyprus, Czech republic, Denmark, Estonia, Finland, France, Germany, Greece, Hungary, Ireland, Italy, Latvia, Lithuania, Luxembourg, Malta, Netherlands, Poland, Portugal, Romania, Slovakia, Slovenia, Spain, Sweden, Australia, United States, Canada, Brazil, Japan, New Zealand, China, Israel, Hong Kong, Norway, Indonesia, Malaysia, Mexico, Singapore, South Korea, Switzerland, Taiwan, Thailand, Bangladesh, Belize, Bermuda, Bolivia, Barbados, Brunei darussalam, Cayman islands, Dominica, Ecuador, Egypt, Guernsey, Gibraltar, Guadeloupe, Grenada, French guiana, Iceland, Jersey, Jordan, Cambodia, Saint kitts and nevis, Saint lucia, Liechtenstein, Sri lanka, Macao, Monaco, Maldives, Montserrat, Martinique, Nicaragua, Oman, Pakistan, Peru, Paraguay, Reunion, Turks and caicos islands, Aruba, Saudi arabia, South africa, United arab emirates, Ukraine, Chile.